A large supply of minerals capable of reacting with CO2 and sizable storage space in underground reservoirs provide two options for geologic sequestration of carbon. 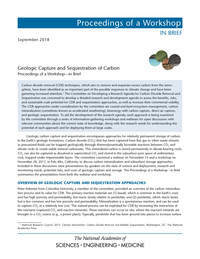 This new publication summarizes a workshop that explored the potential for relatively permanent storage of carbon in the Earth’s geologic formations. Workshop speakers described their relevant work including the state of science and deployment, research and monitoring needs, potential risks, and costs of geologic capture and storage. The workshop was held to inform an ongoing National Academies study, Developing a Research Agenda for Carbon Dioxide Removal and Reliable Sequestration. Other workshop topics for which proceedings have been produced are coastal carbon sequestration, terrestrial carbon sequestration, bioenergy with carbon capture, and direct air capture.